I prefer to play it safe and save for the 2026 kit. The watermark stars and stripes should help with that. 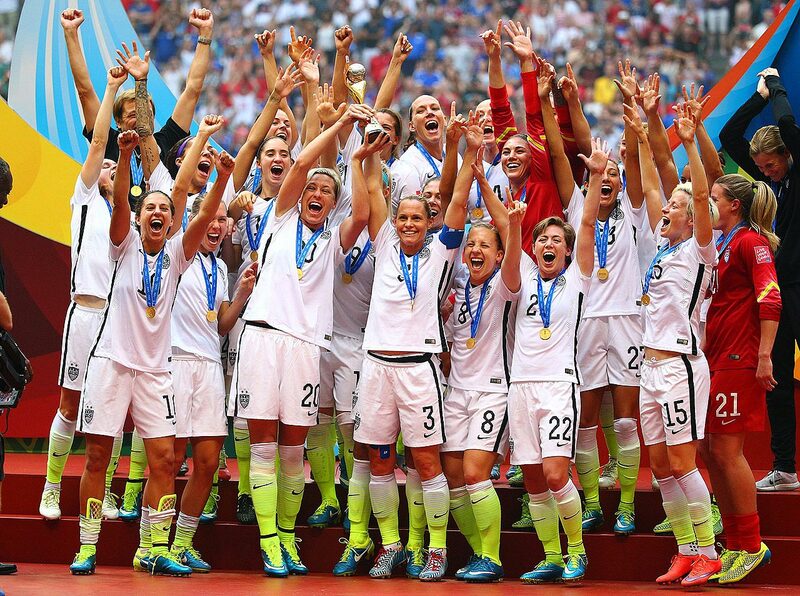 From what's leaked so far, Nike did an amazing job with this year's WWC kits. The red England one is my favorite so far. The new USWNT kits for the World Cup remind me of the pageant drag queens. Girl, take one thing off. If it had one less design element, I'd love them, but instead, they look super busy. Please explain in detail why pink is a "wimpy" color. But my god, I sometimes am concerned for my screen getting burned out with those kits. Per a leak a few weeks ago, this is it. This would be a lot better than the "Team Nik–I mean USA" kits of the 2015 WWC, but for me that was about rock bottom for either team so it's almost impossible not to surpass that benchmark. I know it may not have been the ugliest kit in national team history, but to have not speck of red or blue on a kit, not even on the crest, is simply unpatriotic. Never mind the added insult of the "we just waded through a knee-high pool of highlighter ink" look. Almost four years later, it still upsets me that the team was forced to wear that atrocity through 6 out of 7 games of the tournament, including against opponents like Germany that normally would be the team wearing white. Since the Championship was among those games, the image of the team's first time atop the podium in 16 years will be forever immortalized not as a celebration of the red, white, and blue, but as a celebration of the white, black, and volt yellow, which I'm sure is exactly what our gracious sponsor was hoping for. GO TEAM NIKE! Hey, the US has played in all white for much of its history. Sure, various dorky things have been done with stripes and hoops and such (and don't forget those great 1994 kits! ), but the base has been mostly or all white for a while now. Don't mess with it. It used to be the England uniform but with the US shield. I don't want an all-white kit. Find a way to get some stars or stripes on there, and stick with it. Waldos looked good. The sash ones weren't bad (only Peru does a sash). And the bomb pops were great, if initially derided. I have no problem with a predominantly white kit. I do have a problem with a predominantly white kit in which red and blue are intentionally and shamelessly substituted with the sponsor's brand colors, and even the crest is stripped of its color. TKyle and Guinho repped this. white shirt, navy shorts, white socks for our homes. always. second kit? go nuts. well...nuts so long as theyre white, navy and/or red. get off this royal blue nonsense for sure. id prefer a deeper red, too, but that hasnt gotten out of control. im not against black or grey. my point being i think we DO have a "traditional" look. oh, england also wears white/blue/white too? who gives a f? so, white/navy/white. aways? waldos. all navy. never primarily/all red...say red/white/navy. throw in a sash every now and then if you have to. third kit with the waldos- update the 94 navy with stars. the red/navy gold cup hoops were nice. dorky hoops?! The Waldo is still the best ever! All white is just too boring for me and too much the same as England. I still want our primary/home kit to stay the same basic design, and my preference is the Waldo red hoops. Just my opinion that I haven't changed in a long time now. I want a 1st kit that is unique and immediately identifiable as USA, like the other big teams have. With all white, that doesn't happen. Second kit should vary between different combinations of red and blue. The last 2 away kits (all red and all blue) I think were very good, even excellent. It's not unusual at all for even the "big" teams to have completely different colors for their second kits, although they tend to rotate between the same few colors. It's the third kit where they should let Nike go wild, anything goes. 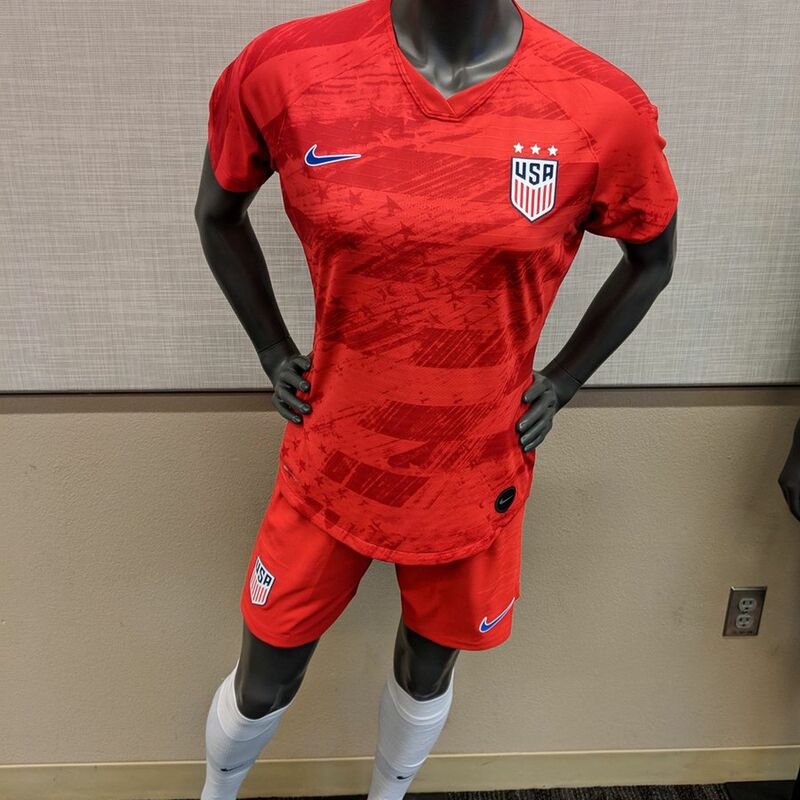 The hoops are awesome, even though it's more like a rugby shirt, but IMO it'd make us different from everybody else who wears red, white, and blue (the most common colors in flags, too --people have no imagination). Why the hell can't we bring back the hoops? Full stripes, not these halfway-ones that we have now. Waldo, was the best ever when it came out, and yet to be bettered. not even close. When the USA plays teams that wear red jerseys or white jerseys, we will probably have to wear blue. Wearing red and white stripes against a team wearing red jerseys or white jerseys will "clash," or will not be enough contrast. I recall that, when we wore the Waldos, there were quite a few games where I wondered why we wore blue and not the stripes. I didn't really put it together until watching Croatia in this past summer's World Cup. Croatia has worn their red-and-white checkerboard pattern for years. At this past summer's World Cup, their "first colors" had a red-and-white check pattern jersey, and their "second colors" had a blue-and-black check shirt. In their run to the Final, Croatia played a total of seven games. They wore their red and white checks only twice--in matches against Nigeria (who wore green) and France (who wore blue). They wore their blue-and-black check jerseys in their other 5 matches--against Argentina (who wore their sky blue and white stripes), Iceland (who wore white), Denmark (who wore white), Russia (who wore red), and England (who wore white). The "problem" doesn't end with CONCACAF. There is a LONG list of other nations that (either always or at this point) wear red or white for both first AND second colors. These include Chile, Peru, Spain, Portugal, Wales, Norway, Denmark, Switzerland, Austria, Turkey, England, Poland, Serbia, Czech Republic, Egypt, Tunisia, Iran, China, and South Korea, among others. Furthermore, if we're the "away" team, we'd be wearing blue against "white teams" such as Germany, Ghana, Senegal, Algeria, and Iraq, as well as "red teams" like Belgium and Morocco. I went back on Wikipedia and looked at the 2013 Gold Cup--during which we had the Waldo jerseys. We wore them in games against Belize (wore blue), Cuba (wore blue), El Salvador (wore blue), and Honduras (wore predominantly blue with white stripes). We did not wear them against Costa Rica and Panama (who both wore red). As much as I love the red and white hoops, they wouldn't be worn as much as many of us would like to see. That IS one nice thing about the current white US jerseys that have the red (turning blue) stripes. Since they are predominantly white, we can wear them against "red teams." Since their release, the USWNT has worn these white jerseys with the red stripes in games against nations wearing red, including Canada, Mexico (who wore red-??? ), Panama, Trinidad&Tobago, and Chile. I WANT us to wear red and white hoops or stripes. But, to actually see us wear them with any regularity, they would have to be as a component of an otherwise white jersey. Going forward, jersey manufacturers (how long is our contract with Nike?) should certainly be able to add prominent red stripes using different designs to otherwise white jerseys. Have the numbers be in navy blue, and pair with navy blue shorts, we'd have an awesome look. So, home OR away, we would have to wear blue. I don't think this is accurate at all. My understanding is the home team wears the kit of their choice (normally their traditional home kit) and the away team has to come up a contrasting colored kit. That's why home and away kits are contrasting. I don't think the teams you listed have the same color red home and away, it doesn't make sense. What happens when they play each other?! Plus, teams now all have a third kit with another different color. I also think if a team wears white we could wear the Waldos as the red really stands out. Plus, we play many more of our friendlies at home that most teams, because the revenue is higher (which is why Mexico plays so many of their friendlies in the US). I think we'd easily be able to wear the Waldos >50% of the time. @TKyle ok I did a bit of research (really little) and now I see your point better, it's a good observation. I was not able to find a photo of Croatia wearing their iconic red and white checkerboard kit against a team in all white (I didn't look that hard though). I did find a Copa America photo of Paraguay in their red/white stripes playing Peru with their white kit with the red sash, which I must admit could have been confusing. So, point taken. But as a Waldo fan I'm still ok with it. I mean it works for Croatia, right? Eventually we'll be able to use technology to make players of teams different, because frankly it limits the selection of color available. Basically you need all-light and an all-dark kits, to contrast with the other guys, and your real kit gets relegated to a third option. With a bit of tech, we could have the "home" team highlighted with a thin green aura, for example, for broadcasts --that in the near future, for sports, is going to be completely computer-based, too. the FOX TRAX glow puck should come back and be used in more sports. The Fox blue glow puck thing is the worst thing ever developed to "enhance" sports viewing. As opposed to the yellow first down stripe for gridiron football, where the developer fully deserves the Nobel Prize. They brought back a version of it in the NHL All Star Game. It wasn't as brightly colored and couldn't track the puck in the air, though. Funny fact: The same guy that developed FoxTrax, also invented the yellow first down marker (as well as baseball pitch tracking, NASCAR tracking, etc.). His name is Rick Cavallaro, and he cofounded a company called Sportvision. I read an article about him a few years ago, where he said that developing a similar type of broadcast enhancement for soccer is the holy grail. As an aside, the puck was never meant to look like a glowing blue glob on the screen. They developed that visual for testing purposes only, and FOX told him they would fix it up before going live. FOX never fixed the graphics, left it glowing blue, and the rest is history. PabloSanDiego, Element 7ero and Suyuntuy repped this. I do love the Waldos. We need something that makes the USA easily recognizable--like Brazil's yellow, Argentina's albiceleste stripes, the Netherlands' oranje, Croatia's checkerboard, etc. I've never gotten why Nike hasn't developed a kind of classic look/template for the US after succeeding so brilliantly at that with Brazil and Croatia. It's a metaphor for USMNT's status in world football, transient and unmemorable. Brazil is literally just the color Yellow. It's no different than when Diadora, etc had the contract before them. It's no different than, say, the Netherlands. Croatia started using the checkers before Nike got involved too. I seriously never understand this critique. Yeah it's really up to USMNT to put their foot down and tell Nike to stop screwing around and settle on a signature for the primary kit at least. I'm sure they'd rather go along for the $$$ though. Can't make $$$ if it always stays the same. From what I remember colored lines were implemented in video games before they were implemented during broadcasts. I remember NFL blitz had yellow and red lines for the line of scrimmage and first down markers way before any telecast had it. You can go with a white shirt with red stripes and change the design from cycle to cycle. Brazil, Mexico, Argentina (and on and on) seem to do just fine recycling the same basic design.